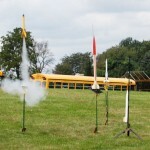 The Penn Manor High School Rocket Team put on two demonstrations for district sixth grade students to introduce them to the rocket club which is offered at the middle school and high school level. 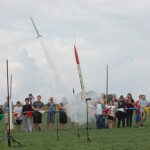 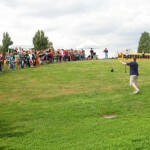 The 2010 and 2004 rocket teams each won the national competition in Washington, DC. 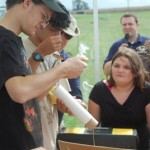 The 2010 team also won the international competition in England. 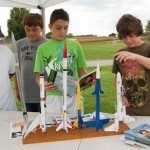 On Monday, September 19, sixth grade students from Conestoga, Martic and Pequea Elementary Schools visited Marticville Middle School and on Monday, September 23 sixth grade students from Central Manor, Eshleman, Hambright and Letort Elementary Schools visited Manor Middle School to hear about the rocket team from advisor, Brian Osmolinski. 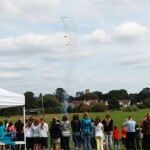 They were treated to launches of six different types of rockets. 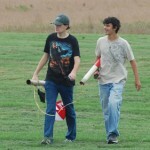 The high school team also brought some of their prototype rockets and answered questions from the younger students.